Hey Kids!! Hooray!!! ITS POPULAR IRONY CRAFT TIME!! September 5th is the birthday of Freddie Mercury, the lead singer of Queen! They were a famous British Rock group with many smash hit songs! He would be 65 today if he had not died from a slow, painful, AIDS related death. Freddie Mercury was so distracted by grooming his mustache that he didn't realize he was late for a concert. He left the house is such a rush that he accidentally left all his color at home. OH NO! Can you help Freddie Mercury get ready for his concert by coloring him? He'll be ever so grateful, maybe he'll let you feel his mustache bristles on the back of your neck. This is so much fun that I just had to join in. I went with a ginger, Puerto Rican Freddie Mercury with the mildly offensive tank top who works at an old timey gas station. You know, one day he is going to run that gas station, old Mr. Dodson just needs to give him a chance. 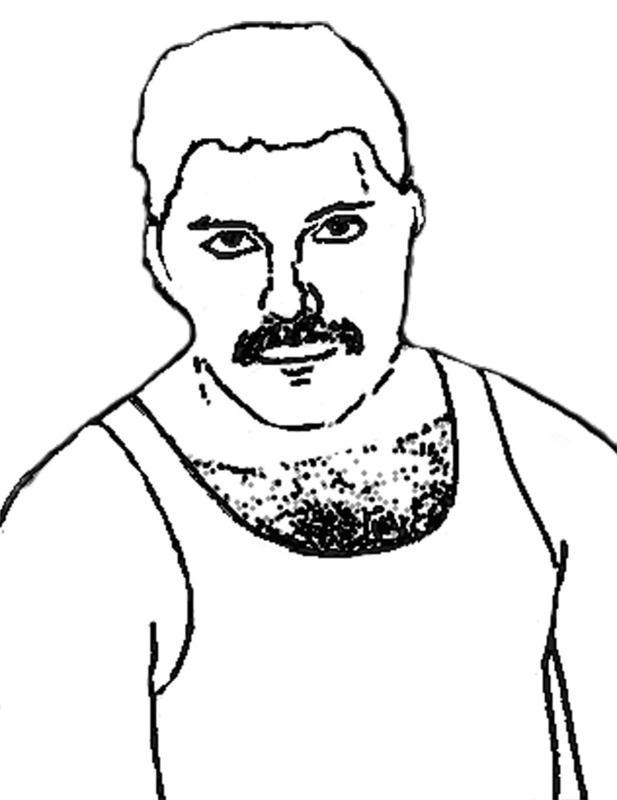 One extra special winner will receive their winning Freddie Mercury displayed on the site AND they will have a custom Popular Irony post written in their honor? More than likely, it will be extremely offensive gibberish. Email Subject Line of "Color Me Mercury"
THOUSANDS WILL ENTER, ONLY ONE WILL WIN!! !